It is such a simple tool to create, yet often overlooked as one of the first steps in students' successful engagement in and completion of a course. It is the syllabus that can be the road map to students' success, yet too often it is given inadequate professorial preparation time and glossed over in class interpretive discussions with students. Faculty, with the support of department chairs, have a high level of responsibility to create syllabi that are clear and detailed for each semester and to avoid the recycling of last academic year's information without forethought to often simple upgrades. These simple upgrades include, among other things, course name, section number, reorganization of assignment due dates, accurate office hours, and locations of classes by the day/hour/online modalities. These elements should be vetted and reviewed carefully each semester by all faculty and approved by the department chair. Faculty teaching different sections of the same course should pay special attention to synchronizing the course description, course objectives, and student learning outcomes (SLOs), particularly those teaching general education/core curriculum courses. While careful attention to detail should be the methodology for the preparation of all syllabi, this article will deal specifically with how attention to detail can enhance first-year students' engagement and success. Why are students taking this course? Is the course required or elective? Make this clear in the syllabus. Is the course a part of the general education curriculum? If so, how does it contribute to all disciplines/majors in terms of essential knowledge and skill-building? This can and should be a discussion point during the review of the syllabus in the first days of the class. What are the SLOs? Is it clear from the syllabus that the course objectives and SLOs, while connected, are not the same? This is another opportunity to discuss, during first class days, SLOs as students' measurable demonstration of knowledge, skills, and dispositions at various touchpoints in the class (pre-assessment, mid-point/signature assignments, and post-assessment). How is the course material organized? Why? Materials are presented in a certain order for a reason; help students understand that there is a logical progression to the course material and that the instruction, assignments, and evaluations are not random but targeted for their success. Where are the required and recommended materials? Making sure that students have both access and knowledge of the locations of the necessary materials that are presented on the syllabus is key to their success. Often, this means discussing where resources reside beyond those that can be (or must be) acquired through the college/university bookstore. Faculty should plan to have the first class day or days as one(s) of rigor in methodically reviewing the syllabus with students. It is important to be intentionally thorough in engaging students in questions and comments. For first-year students, some 'teasing' out of questions and comments may be necessary as many of them are interfacing with an entirely different road map (the syllabus) to their success than they have utilized in their high school experiences. It is important to emphasize to students that the syllabus is the written contract between professor and students. It is most appropriate to end the syllabus with a statement as to how changes will be made in the event of extenuating circumstances and/or as approved by college/university policy. Faculty can influence first-year students' success and engagement through the in-class discussion of the syllabus by emphasizing to the students that the document creates an agreement on how they will reach their successful exit from the course not only in terms of the grade but also in terms of their acquisition of knowledge, skills, and dispositions as articulated in the SLOs. Make sure to require students to abide by the dates, procedures, and formats as specified in the syllabus. In doing so, faculty are agreeing to do the same, which makes the importance of a well-written syllabus and the attendant class discussion of the syllabus so very important. 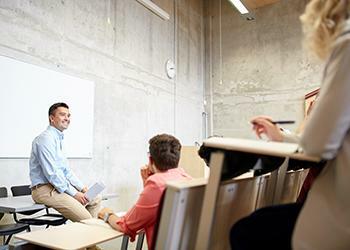 Students should have access to the syllabus on their first day of class (if paper copies are being used) and even before in the posting of the syllabus and other pertinent course information in the college/university Learning Management System (LMS), such as Canvas, Blackboard, Moodle, etc. Another successful technique in many years of teaching has been to review where the class is per the syllabus at the beginning of each class period to include the reiteration of assignments and due dates and forthcoming work for the next class. This also enables any adjustments to the syllabus if more time is spent on topics, etc. during a specific class period toward altering the schedule of future topics/assignments. Read the entire syllabus at the beginning of the class and ask questions during the initial in-class review of the syllabus. During the course of the semester, visit the professor during office hours to get clarity on information (assignments, due dates, criteria, etc.) on the syllabus that on-going class time may not enable. First-year students, as well as upper-level students, are enabled to succeed through professors developing a well-written syllabus. While several pages of syllabus text cannot "speak" for itself, this "road map" properly communicated, continually shared, and reviewed can move first-year students into spaces of socialization and acclimation to their new academic world. M. Danielson asserts, "To the extent that the syllabi can transmit role-related and cultural knowledge, it is contributing to the classroom socialization process" (1995, p. 8). Well-prepared syllabi exist as one of the initial footprints toward first-year students' academic success and socialization to heightened educational expectations. Communication of the information in the syllabus -- active and ongoing -- will move print to purpose. Danielson, M. (1995, April). The role of syllabi in classroom socialization. Paper presented at the Annual Meeting of the Central States Communication Association, Indianapolis, IN. (ERIC Document Reproduction Service No. ED387845).